What the heck is a dot journal? It’s a planner, to-do list, anddiary for every aspect of your life: work, home, relationships, hobbies, everything. - Accoutrements such as washi tape, book darts, and more! I love to use my planner. It helps me stay organized and helps me not to forget appointments, goals I want to accomplish as well as make sure I stay on track for keeping my household organized. I try to write in it at least twice a week. 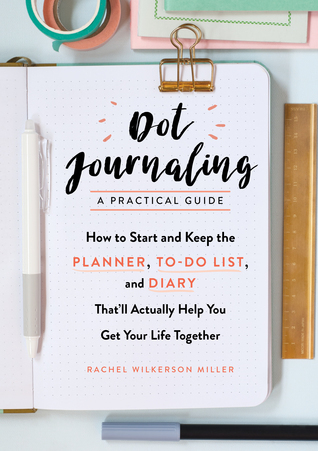 I was excited to read Dot Journaling because I've been interested in using a bullet journal and I've seen so many cool ways you can use them. From to do lists to keeping track of all your favorite Netflix shows, you can do so much with a bullet journal. The book is filled with ideas on how to organize the things that are important to you. I've found so many different other lists I can use to fill my journal with. There are so many different ways you can use dot journaling (bullet journaling). If you're just starting, looking ideas up online can be a bit overwhelming. There's just so many unique ideas out there and people are so creative on how they use it. I love how all the information you need to start is in one book and how this book was easy to follow and gave you simple ideas to start with. Not only were you given loads of ideas to fill your journal with, but I love how there was quotes and facts about famous journals from the past and how the author shares a recommended list of supplies for those just beginning. A great book to read if you are a planner or someone who wants to start planning, you won't be disappointed. We're excited to be offering one copy to one of our readers. Just comment below your favorite way to use your planner/bullet journal. Disclosure: All opinions are my own. I received Dot Journaling at no cost for the purpose of this review. No other compensation was received. I have ever used a bullet journal - but I love making lists, and writing down plans in an agenda or calendar! I have several on the go at once! I've never used a bullet journal but I love the idea of a planner and diary together in one. I would love this, all I use to journal now is just notepads, would love something like this! I love decorating and keeping a journal of my life that way. I put everything in it as you do . I have been journalling this way for decades . I like to use different coloured markers and lots of fun stickers in my bullet journal. I use bullet journal for schedules and tasks stamps and markers. sometimes stickers work too. I would use this journal for goals and dreams. I just started using a bullet journal this year. I love making lists and keeping track of things like books I've read & tv series I'm watching. I have not used a bullet journal but I should be. I tend to forget dates and things I need to do. I would use mine to track my food and water intake to help with my weightloss goals. I use my planner to keep me on track with cleaning tasks. I use it to keep up with personal tasks, family activities and work projects. I use my planner to keep track of activities and upcoming birthdays. I like to plan out my week and keep track of appointments. I would use it to plan my life. It would be my first bullet journal. We use a calendar to plan our upcoming events but love the idea of being able to journal at the same time to talk about the events. I use a planner to help keep track of important dates and to help meal plan. I use it to plan out my daily activities.